Enamel is a non-living dental structure on the outside of the teeth with no blood or nerve supply. The clear advantage from the lack of nerve supply is enamel's insensitivity. 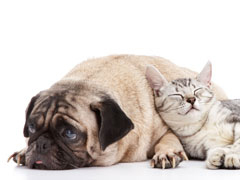 Enamel insensitivity allows the pet to eat or drink hot or cold items, without pain or discomfort. The lack of blood supply results in the disadvantage of enamel's inability to repair defects, or heal from injury. What is an enamel defect? Enamel is the hardest structure of the body, and serves as a protective structure for teeth. Enamel defects may occur during tooth development, from traumatic injury, from microbial (bacterial) degredation (cavity formation), from systemic infectious, or inflammatory problems that interferred with the function of the ameloblasts during the time those areas of the crowns were to have enamel production or a combination of these factors. Why are enamel defects important? Defects of the enamel expose the underlying dentin. Dentin is sensitive, has blood and nerve supply, and some ability to repair. Dentin has small tubules that contain nerves and project from the pulp out to the enamel. When enamel is missing, these tubules become exposed, and can result in sensitivity. Some animals with enamel defects can be very sensitive or painful. Exposed dentin tubules also allow bacterial penetration, tooth pulp infection, inflammation, pain and death. The consequence of unaddressed dead teeth can lead to the systemic spread of bacteria (through the bloodstream) to major organs such as: the heart, kidney and the liver. Enamel defects typically result in tooth discoloration form both dentin repair, and calculus (tartar) accumulation. Are there breeds with potential greater risk for enamel defects? We have seen enamel defects in many breeds. At the University of California Davis, an Autosomal Recessive Amelogenesis Imperfecta or familial enamel hypoplasia (defects) in the Samoyed have been described https://www.vgl.ucdavis.edu/services/dog/Samoyed.php. How are enamel defects treated? Enamel defects are initially evaluated with periodontal probing and with dental radiographs to understand the extent of the problem. The depth of the defect is important. If the defect involves enamel, or enamel and dentin, these teeth may be restored. If the defect has affected the pulp (inside of the tooth), root canal therapy with restoration may be appropriate. Dental extraction is an alternate treatment for teeth with enamel defects. Enamel defects can appear on any tooth and in any location on those teeth. 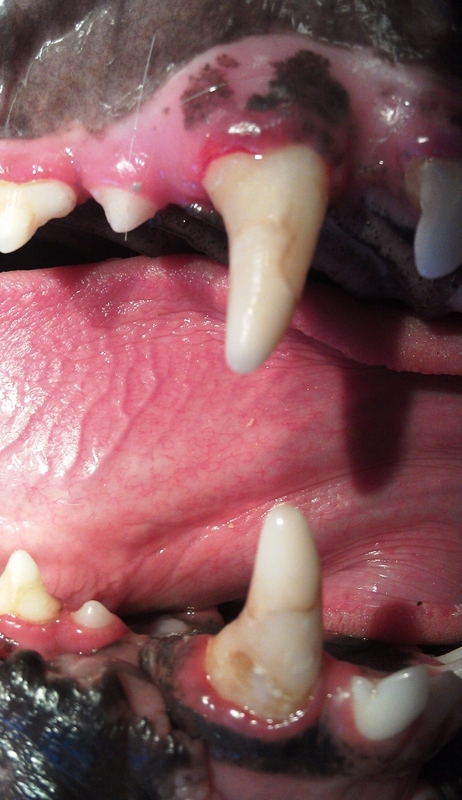 dental extraction of the primary canine tooth. two dogs playing "tug of war". Enamel defect from playing "frisbee". Enamel defect of unknown cause. Deep enamel defect from cavity formation. Close up of the above enamel defect. Teeth with enamel defects must be evaluated with dental radiographs to ensure the teeth are vital (alive). Teeth with enamel defects are prepared by cavity preparation. The defect is scaled to remove plaque, calculus and debris. Hand instruments are used to remove rough dentin and unsupported enamel rods. Care is taken to avoid pulp exposure. The tooth is then etched, a bonding agent is applied and thin layers of composite is placed in 2mm or thinner layers incrementally until the defect is completely filled. Abrasive composite finishing disks are used to shape and smooth the composite restoration. Three layers of bonding agent is then covered over the restoration and the adjacent enamel. Initial view of enamel defect located Alternate view of the defect. View of the final restoration.